It seems that more and more companies are listening to what a lot of people are asking for and that is more options for natural hair care. Not Your Mother’s is a brand that I have come across many times on my search for hair products but with a majority of their products having silicones or sulfates, which I try to avoid for the most part, I found myself avoiding the brand as well. Finally, I heard the brand recommended and was able to run out and pick up some products, because they recently released a naturals line. NYM Naturals (Not Your Mother’s Naturals) are four separate lines that are free of sulfates, silicones, phthalates, parabens, gluten, and synthetic dyes. The four sets they break them down into are curl defining, repair and protect, volume boost, and high moisture. Of course I decided to pick up the curl defining line and give it a try. I picked up the four products that are in the curl defining line, including the curl defining shampoo, curl defining conditioner, curl defining combing cream, and the curl defining detangler. The main ingredients highlighted to do the most good in this line is the mango butter and Tahitian gardenia flower. Looking at the shampoo and conditioner first, these two products are packaged with a pump and at $8.99 are affordable options for curly girls on a budget. For me, the shampoo had the perfect amount of cleansing to moisture ratio and left my hair and scalp feeling cleaned. The conditioner on the other hand was slightly lacking in its amount of moisture, I found it works great as a final conditioner that I leave in my hair but would not work for me as my standalone rinse out conditioner. I did enjoy both of the shampoo and conditioner and will definitely continue to use them in my routine. Next up we have the styling products in the line, this includes the combing cream and the detangler, and again, both are sold at $8.99 and have a pump. I primarily tried to use the detangler as a leave-in in my style routine and the combing cream as my curl cream. Unfortunately for me these two products didn’t do much to aid in the definition or hold of my curls throughout the day, while my hair did feel moisturized, it also felt frizzy and dropped by the end of the day. I have also tried using a hard hold gel overtop with no luck, for wash day styling these products didn’t work for me. One overwhelming positive though is the sprayer that the detangler comes with, I have yet to use a product that I could spray directly into my hair without worry but somehow the detangler sprayer is able to spray a fine mist of conditioner evenly and without mess. Although not for my wash day, I did find the detangler to be useful, I found that when added to hair before putting it up for the night or for second day curls it provided a lot of moisture to help tame and control frizz. I did still need a serum or light gel on top for second day curls but the detangler was enough to keep my hair soft and not stringy even when I added a spray gel on top. I am over the moon that other popular brands are starting to come out with options that are natural and free of harmful ingredients and am very excited about Not Your Mother’s brand coming out with so many options in that vein. 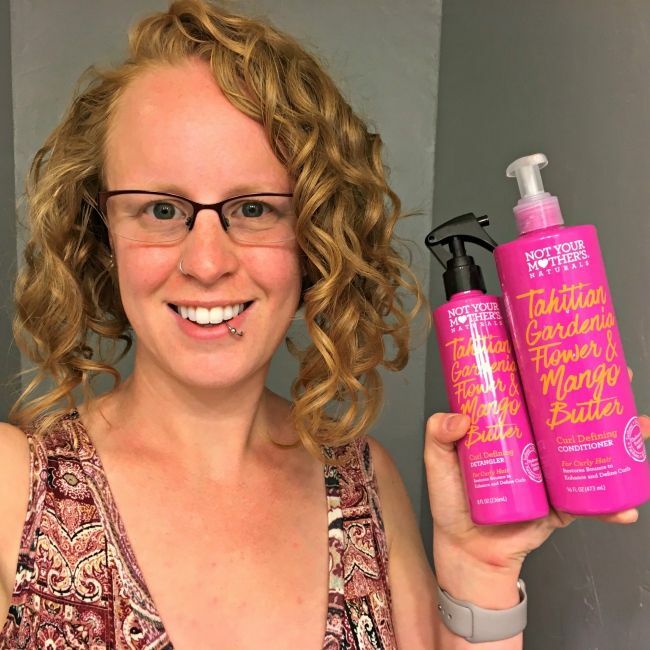 While the styling products were not enough hold for my curls, the shampoo and conditioner have definitely made their way on to my rebuy list! Have you tried the Not Your Mother's Natural Hair line? Like us on Facebook to see what we're talking about now.